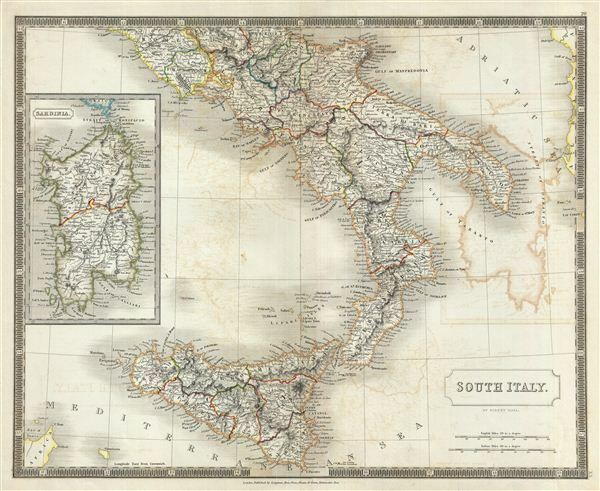 This is a beautiful map of southern Italy and Sicily from Sidney Hall's extremely scarce 1835 New General Atlas. It covers the Kingdom of Naples (a common reference for the 'Kingdom of the Two Sicilies') which extended from the Papal States south to include all of Sicily. An inset along the left border details the Island of Sardinia. Towns, rivers, mountains, railroads, canals, marshes, forests, and various other important topographical details are noted. Elevation throughout is rendered by hachure and political and territorial boundaries are outlined in color. This map predates the Italian solidarity movement and consequently, the peninsula is divided into an assortment of kingdoms, duchies, republics and states. The Kingdom of Naples was the richest and largest Italian state before the Italian unification. Following the defeat of Napoleon and the merging of Sicily and Naples into the Two Sicilies, the Island of Sicily witnessed revolts against the Bourbon rule in 1820 and 1848. The final revolution in 1848 resulted in the island gaining independence from Bourbon control for 16 months. This period thus also saw the birth of the ‘La Giovine Italia' Italian solidarity movement. In 1830 a series of insurrections throughout Italy lead to the adoption of the Tricolore and nearly established a united Italian state. Unfortunately, in 1831, Pope Gregory XVI invited the Austrian army to help crush the insurrections, postponing the push for Italian solidarity until the Revolutions of 1848. Rumsey 4224.020 (1830 edition). Philips (Atlases) 758. Ristow, W., American Maps and Mapmakers: Commercial Cartography in the Nineteenth Century, p. 303-09.